Our analog Audio Consoles cover the entire range of applications. In addtion to the Casette Module based Systems V700 and INTEGRATOR, there are 3 basic versions for music recording and mixing, each with several variants. All systems are completely modular and offer the choice to configure a quasi custom mixer by selecting input channels, master sections, frame versions out of a huge collection of modules. Within a particular version, everything that belongs to this version is compatible and can be combined in any way. All the systems share the same quality and sonic performance and use the same technology and the same components. A smaller system is less expensive since it is smaller and has less features and not because of a lower quality level. 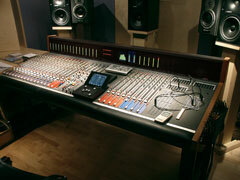 The compact console version C offers the quality, versatility, and variability of the system in a very compact format. 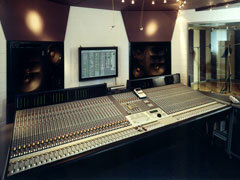 The frame is only 960 mm deeo and the width of a 32 channel automated console with patch bay is 2.25 meters. Though the size of the compact console is small a full range of modules offers configurations for almost any purpose from a small and simple mixer to a sophisticated high-end audio mixing desk. Where size is a problem, a Series C compact audio console is the best choice. 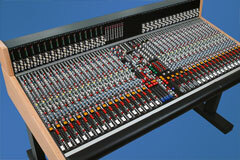 If you are looking for a really big analog production mixing desk, this is it. The MAGNUM-V3 is certainly the biggest analog mixer available today. We are not talking about the phsysical size of the Magnum but specifically, what it offers. Mono inline channels with 2 automated faders, 5 band EQ with 4 fully parametrics, compressor expander, separate noise gate, in addition a denoiser, high-pass and low-pass filter, real 48 bus routing, 11 sends and a dual aux extention , stereo input channels with the same processing facilities plus MS direction mixer, base width control, MS-equalizer, elliptic equalizer, recall computer, up to 256 automated faders, quarter frame resolution, 0.1 dB fader accuracy, 8 fully featured, automated stereo effect returns with parametric EQ, base width control, expander...you see, the list is endless. A huge assortment of input channels, master blocks, automation computers, and additional equiment makes the Version S our most universal audio console. This priciple allows the combination of a quasi customized mixing desk 'of the shelf' that can be configured for every application. The Series D is designed primarily for music production and recording. The fully featured module set and the availability of several different master blocks make it possible to cover the range from a sophisticated recording desk to high-end automated audio mixing desk for the final mix. The Series MR is the Music Production version in the range of the 5MT system. Very extensive inline-, split and stereo channels with fully featured processing stages (Compressor/Expander, Noise-Gate, Filters, 5-Band-EQ, 9 Aux + Stereo Q, + stereo /dual mono extention send, 2 automated faders per module in mono and stereo module) are combined with the CAS Automation and Recall Computer. 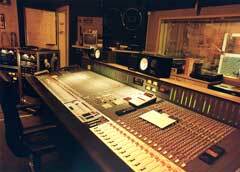 The first adt-audio 5MT mixing console was developed in 1985. We launched this series with the mixer that is the 5MT Series S today. The major difference of the 5MT design was that already in the very beginning the entire system was redundant in any way. Many unsused bus rails, enough additional space for every further upgrades were combined with a frame construction that makes possible frame sizes up to 5 meters in one piece. Instead of designing the next system while the first consoles were in production we developed compatible new modules, master sections, automation computers, meters, and patch bay versions for the system. Within the last 20 years a huge collection of equipment has been designed that makes it possible to use the entire system like a construction kit. Though we do not stock most of the components, we are able to deliver almost everything at short notice. We stock pcb's, top plates and a lot of special components, so that the lead time for the production of a certain device is below 4 weeks. This work has paid off for more than 20 years. The entire range of equipment for the 5MT covers the range from a small and simple to operated 'working horse' to a sophisticated fully featured automated analog console for the mix room. Over the years, we divided the 5MT series into several different versions. Of course we are still keeping all the components compatible to each other.